Blockchain technology is best known for both its security and immutability. In a blockchain ledger, blocks act as a living record of transactional flow and are secured through heavily incentivized consensus mechanisms. These consensus mechanisms are incentivized due to the distributed nature of the system and anonymous participants. Its underpinnings have been around for several years but it wasn’t until the creation of bitcoin that the first example of a successful implementation of a decentralized ledger was deployed in a secure fashion. The Bitcoin network relies on what’s called “public key cryptography,” where both a “public key” and a “private key” are used to transact. A public key is the equivalent of your address, or rather, where you will receive cryptocurrency. In the case of bitcoin, when transacting, ownership rights of the bitcoin in question are signed off on by using a private key to do so. For example, let’s say Alice wants to send Bob one bitcoin. Alice will create a transaction to be sent to Bob’s address, and in doing so, she is giving Bob the right to transfer that bitcoin. Both her transaction and Bob’s future transactions involve proving ownership using their keys. The public key acts as ownership proof on the network while the private key exists to sign off on transactions. It is important to remember that private keys should never be given out, as it is what keeps your funds secure. Giving away your private key is the equivalent of giving away access to your bank account — you wouldn’t want it falling into anyone’s hands. However, a public key must be given to any party wishing to send funds to your wallet. 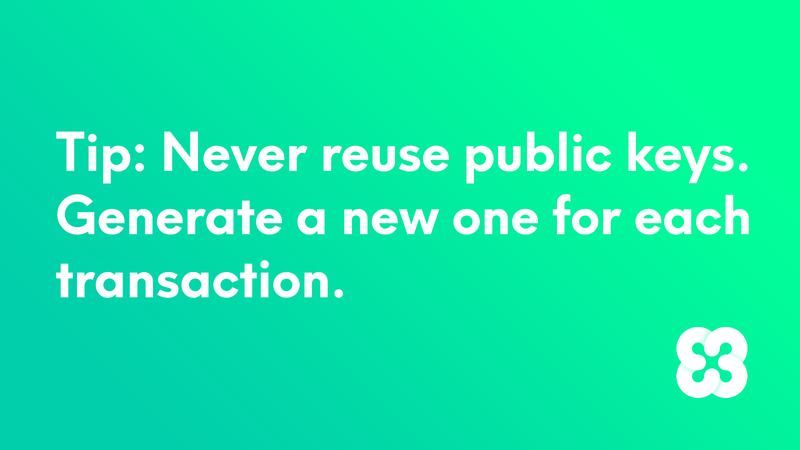 A recommended security practice to protect one’s privacy is to never reuse public keys and to instead generate a new one for each transaction. The public key is derived from the private key, and both are required in the movement of value on the network. After the transaction is sent, it is then relayed to the network and included in the next block on the blockchain to eventually be mined and secured on the ledger. Consensus algorithms are a key component in distributed computing systems, and “proof of work” is the consensus algorithm the bitcoin network utilizes to both confirm transactions and add blocks. By that point, proof of work was also the first consensus mechanism to be deployed in a blockchain network. Imagine the case of a horse race occurring on average every ten minutes. The gun fires, and the first horse to cross the finish line earns the bitcoin and transaction fees associated with each block. The race then resets in perpetuity. The process itself is like finding a needle in a haystack — with enough computational power and generation, the answer is bound to be found eventually. The block reward is what keeps miners incentivized to continually try to find a solution to the puzzle and lend their computational power to the network. Distributed ledgers aren’t necessarily free from malicious actors, but incentive systems exist within the networks to keep participants in line. There are a few ways in which disruptors could potentially wreak havoc on the network, with one of the major attack vector being a 51 percent attack. The likelihood of an individual being selected to create the next block is directly dependent on how much of that cryptocurrency they own. Although the consensus could be affected by a smaller group of large holders due to the increased likelihood of them being selected, they are incentivized to act efficiently, as the value of their holdings are proportional to the success of the network. In the future, Ethereum will be switching to a proof of stake system to replace their existing proof of work consensus.